NEW YORK, NY--(Marketwired - Dec 10, 2013) - IMG, the global sports, media and fashion company, today announced that TV talk show host and personality Steve Harvey has signed with the company for exclusive management and representation for marketing, endorsements, appearances and speaking. 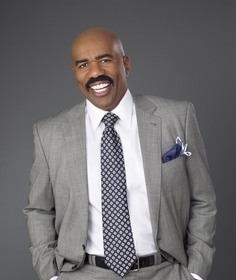 Steve Harvey is a well-known TV personality, talk show host, actor and comedian. He currently serves as host of two popular TV shows, "The Steve Harvey Show," which premiered in 2011 and the game show, "Family Feud," which he began hosting in 2010. He also hosts a nationally syndicated radio show, "The Steve Harvey Morning Show," since its inception in 2000. Harvey first became famous as the host of "Showtime at the Apollo." He went on to star in his own sitcom on the WB network and has appeared in multiple TV shows through the years as a guest star. His movie credits include being one of the four comedians featured in the Spike Lee Film "The Original Kings of Comedy." Harvey is also a published author, writing the book, "Act Like a Lady, Think Like a Man: What Men Really Think About Love, Relationships, Intimacy, and Commitment," in 2009. The book later inspired a movie, which he starred, in 2012 of the same name, "Act Like a Lady, Think Like a Man." "I'm incredibly lucky in that I truly enjoy what I do and want to continue to entertain and connect with people. As I continue to look toward the future and where that will take me in my career, I'm confident IMG will offer a competitive edge when pursuing new business partnerships across the entertainment industry and broader marketplace," said Steve Harvey. Senior Corporate Vice President, Head of IMG Clients, Sandy Montag, said, "Steve has a very dynamic personality that has translated to success both on the screen and the stage. His natural charisma and ability to engage with an audience are characteristics that we will look to capitalize to strengthen his brand value. We are excited to be working with him to explore and evaluate future opportunities." Steve Harvey has been nominated and won several awards throughout his career including, seven NAACP Image Awards for his work in The Steve Harvey Morning Show (radio), 2013 People's Choice Award Winner for Favorite New Talk Show Host - "The Steve Harvey Show," 2012 Daytime Emmy Award Nominee for Outstanding Talk Show Host for "The Steve Harvey Show," 2011 BET Humanitarian Award and another Daytime Emmy nomination in 2010: for Outstanding Game Show Host for "Family Feud." In 2013, Steve Harvey received his star on the Hollywood Walk of Fame. Steve Harvey's management team at IMG will be led by Ira Stahlberger, Senior Vice President of IMG's Client division. IMG Worldwide is a global sports, fashion and media business, with 3,500 employees operating in more than 30 countries around the globe. IMG's areas of expertise are diverse and wide ranging: IMG College; IMG's Joint Ventures in India, Brazil, China and Turkey; IMG Media; IMG Events and Federations; IMG Golf and IMG Tennis; IMG Fashion; IMG Models; IMG Art+Commerce; IMG Clients; IMG Academy; IMG Consulting and IMG Licensing. More information is available at img.com. Follow us on Twitter:@IMG_Worldwide and Facebook: facebook.com/IMGWorldwide.